The Historic Wintersburg site on Warner Avenue and Nichols Lane includes the former home of Wintersburg Japanese Presbyterian Church. 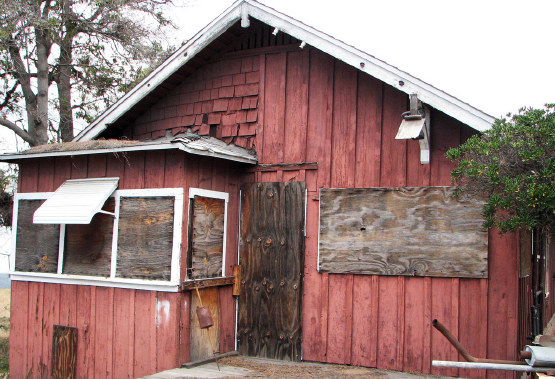 Preserve Orange County has released its first annual list of the Most Endangered Historic Places in Orange County to raise awareness of the threats currently faced by some of the county’s remarkable resources. These sites are at risk of being demolished or irreparably altered because of inappropriate development, insufficient funds, insensitive public policy and/or neglect. The list includes buildings of architectural distinction and others with significance for the county’s shared cultural heritage. All contribute to a sense of place for the residents of the communities where they reside. Among those on the list is Historic Wintersburg in Huntington Beach, a National Treasure historic site representing Orange County’s early agricultural history and the West Coast’s immigration and civil liberties history. The property consists of six extant structures on a 4.5-acre site, including the C.M. Furuta Gold Fish Farm and the Wintersburg Japanese Mission. It is recognized nationally as a rare, Japanese pioneer-owned property with intact physical features that convey the progression of Japanese American history. Three generations of Japanese American history are represented — immigration of the Issei from Japan in the late 19th century, restrictions on immigration and marriage, the exclusion and discrimination of California’s Alien Land Laws, the incarceration of Americans of Japanese descent during World War II, and the return to California to recover lives after confinement. The Historic Wintersburg Preservation Task Force is partnered with the National Trust for Historic Preservation and the Trust for Public Land in an effort to purchase the property from its current owner, Republic Services, a waste management company, for preservation as a historic site and public park. Discussions with Republic are entering the third year and the Historic Wintersburg property remains endangered. “We’re pleased to see another historical organization recognize the significance and rarity of Historic Wintersburg, particularly right here in Orange County, where the historic preservation movement is racing against the clock,” said Mary Urashima, author and chair of the task force. “In addition to the National Park Service noting the property is eligible for the National Register after their inspection in 2013, Historic Wintersburg also has been deemed a rare American historical property by other national organizations. Historic Wintersburg was named one of America’s 11 Most Endangered Historic Places in 2014 and, in 2015, it was designated a National Treasure by the National Trust for Historic Preservation. There are less than 100 National Treasures in the United States and Historic Wintersburg is the first and only National Treasure in Orange County. “In addition to the National Trust, we are joined by the Trust for Public Land in the effort to purchase the property at fair market value. We hope there will be a positive, collaborative process with the current owner, Republic Services, formerly Rainbow Environmental Services. For more information, visit www.HistoricWintersburg.blogspot.com. Also on Preserve Orange County’s list are Sexlinger Orchard in Santa Ana, Villa Park Elementary School in Villa Park, Bob’s Big Boy in Garden Grove, and Lydia D. Killefer School in Orange. Preserve Orange County was founded in 2016 by a group of county residents who identified a need for a central organization concerned with historic preservation in the whole county. As a nonprofit membership organization, its mission is to work through education and advocacy to promote conservation of the county’s architectural and cultural heritage. For more information, visit www.preserveorangecounty.org.